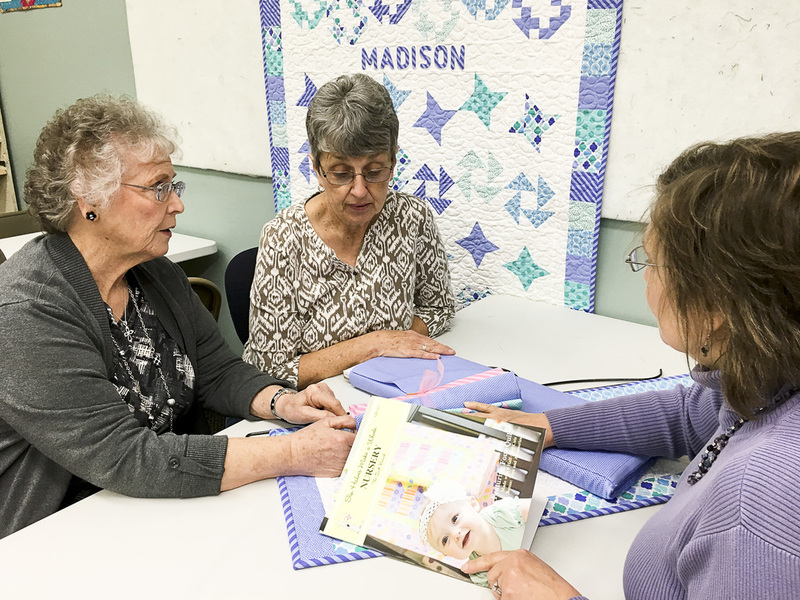 The Quilt Branch offers many learning opportunities for quilters based on the most popular patterns. Contact Susan through the form below for more information and to schedule a trunk show or class at your quilt shop, guild or group. Download the list in a PDF here. Throughout her quilt designing career, Susan has gathered a large collection of quilts, wall hangings, table runners, table toppers and other items that highlight her love for fabric and design. While showing lots of quilts, she will share some designing experiences and quilting tips to inspire quilters of all skill levels. This trunk show can be personalized for your group's specific interest. Note: Each participant is required to have their own, purchased copy of the pattern or book. Click the name to view and see how to purchase the patterns. Place mats 12” x 16” from the book Six Halves Make a Whole. This is one of the most popular patterns in the first book using the Six Halves concept. You will need 6 half-yard cuts of fabric; 3 lights and 3 darks are suggested. No additional fabric is needed to complete this project as the backing is included in the 6 half-yards. Susan will give you tips on making up a fabric-coded “cheat sheet,” and you will be on your way to completing the project in one day. Choose 3 fabrics each from 2 coordinating color families to make delightful 14” x 18” placemats from the Six Halves Make a Whole series. You will learn to cut accurate trapezoids using the House Ruler (required) by Creative Grids. With 6 half-yard cuts you get 6 complete coordinated placemats (fronts and backs included). You can make some for every season. This class is perfect for when you are ready to make an adorable baby quilt featured in the book Six Halves Make a Whole Nursery. Pick 6 half-yard cuts – 4 of equal value and 2 lights – plus a background to have a great time making Spinning Tops. This quilt (52” x 64”) has a matching pillow, too. Quilt Size 44”x 60½”, an individual pattern using the Six Halves Make a Whole concept with 6 half-yard cuts of fabric with high color contrast plus fabric for borders, backing and binding. You will be learning something new as you cut and sew this scrappy quilt together. You can use the provided templates within the pattern or learn how to place the ruler to cut the 60 degree triangles. A recommended notion is a 6” wide ruler with a 60 degree marking. Eight-sided table topper 31” x 31” from the Table Topper Book 3, FALL, the third in a series of four seasonal table topper books. This very elegant topper is perfect for your Thanksgiving table. With the right color choice of fabric, it could be used for the complete holiday season. This is a quick project and could be completed in one day. Also included in the book are two other patterns for September and October. Eight-sided table topper 31” x 31” from the Table Topper Book 4, WINTER, the fourth in a series of four seasonal table topper books. This is a keeper! Any advanced beginner will see it is worth the extra effort to make this grand Christmas centerpiece. The sample is made with batik fabric, but any Christmas fabric will work well. Also included in the book are two patterns for January and February. Irish Mist is the cover quilt for The Quilt Branch’s most popular book, Six Halves Make a Whole Lot More. Your six half-yard cuts are 1 light, 4 medium and 1 dark. Add your background, borders, binding and backing to make this stunning 68”x 80” quilt featuring a medallion center. Choose 6 half-yard cuts of fabric and a background and you are ready for a heavenly experience. This large lap quilt (46” x 56½”) is a great way to learn to use either the House Ruler (required) by Creative Grids USA and learn how to match up all your 45-degree angles perfectly. This is the cover quilt from the book Six Halves Make a Whole Nursery. Choose 6 half-yard cuts of fabric for this quick and easy baby quilt. This large lap quilt (46” x 56”) only has 2 rows that are repeated 12 times. A great project for a new mom that only has a few minutes a day for creative time. Eight other projects are included in the book. Learn to use the House Ruler by Creative Grids and create a one-of-a-kind sampler with lots of 45-degree angles. This quilt starts from six half-yard cuts of fabric. Adding a background and a sashing fabric makes it a nice sized lap quilt (62” x 78”). The pattern is broken into five lessons in the book, Six Halves Make a Whole Sampler. During the course of two days, Susan will walk you through it all. The book also includes a table runner and tote bag. Start with 6 half-yard cuts of fabric, add a background for the main blocks, fabric for the alternate blocks and borders to make this unique quilt. It is made up of four each of 7 different blocks plus alternate blocks to make a large lap quilt (64” x 80”). During the course of two days, Susan will teach you how to make each component. The Six Halves Make a Whole Starburst book also includes a table topper pattern. Susan, please come teach us! Please indicate when, where and what you would like Susan to come share in the form below. You may also inquire about upcoming classes.